I'm an eclectic reader. My shelves contain a healthy mix of literary fiction, fantasy, mystery, and even middle grade novels. Sitting right next to all of that escape reading are a good number of true stories, science, history, essays, and biography. These days, I doubt I could name just one genre or subject as my favorite, but when I was in elementary school, I used to tell people that biography was my go-to. 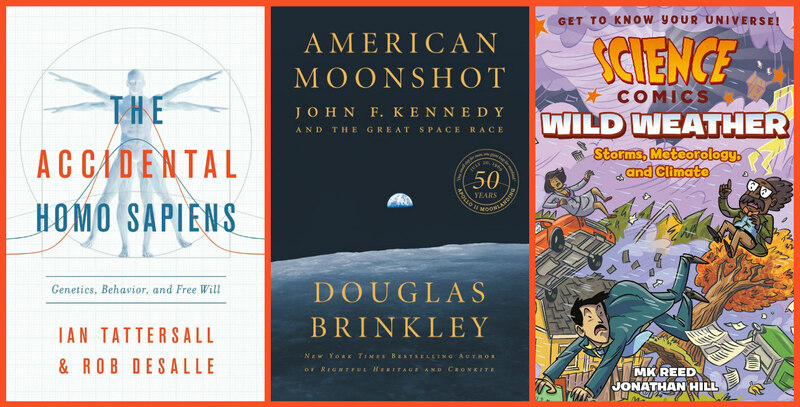 Today's roundup highlights the nonfiction titles I've added to my April reading list. I know I won't get to all of these, but the following 10 books are the ones that caught my attention. The list contains biography, history, science, personal essays, and memoir, so I hope something here will find its way to your own bookshelves. Note that I'm not including food writing/memoir, which I'll save for my Weekend Cooking posts. The Accidental Homo Sapiens: Genetics, Behavior, and Free Will by Ian Tattersall and Robert DeSalle (Pegasus Books; April 2). This book examines human evolution from a contemporary theoretical context, looking at the interplay of genetics and behavior, the way humans solve problems and change their environment, and the biological future of our species. Why I want to read this: Tattersall was youngish paleontologist, already making a name for himself, when I was in graduate school. He and DeSalle are both associated with the American Museum of Natural History and are well respected in the fields of physical anthropology and evolution. This topic is closely related to my own academic interests. 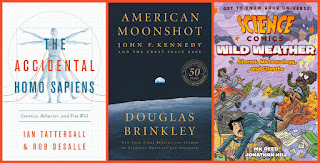 American Moonshot: John F. Kennedy and the Great Space Race by Douglas Brinkley (Harper, April 2). 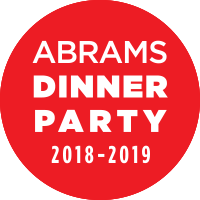 I can't summarize this better than the following sentence from the publisher: "A vivid and enthralling chronicle of one of the most thrilling, hopeful, and turbulent eras in the nation’s history, [this book] is an homage to scientific ingenuity, human curiosity, and the boundless American spirit." Why I want to read this: First--gawk!--it cannot possibly be 50 years since we first landed on the moon; it was 20 years ago tops, right? I'm particularly interested in this account because it includes new interviews and firsthand accounts of the politics, people, and technology that allowed JFK's challenge to be met ahead of schedule. Science Comics: Wild Weather: Storms, Meteorology, and Climate by M. K. Reed and illustrated by Jonathan Hill (First Second, April 16). This book helps us learn to distinguish between weather and climate and tells us all about new weather technology and how major storm systems develop. This fun nonfiction comic answers all our questions about storms throughout the seasons. Why I want to read this: I'm curious about the world around me and love the idea of learning more about weather through a nonfiction comic. This may be geared to middle grade readers, but I'm sure I'll discover something new about meterology. 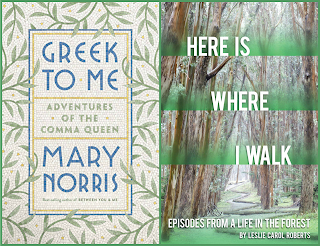 Greek to Me: Adventures of the Comma Queen by Mary Norris (Norton, April 2). Norris is widely known as the chief copyeditor of The New Yorker magazine and in this collection of essays she talks about English, words, and her love affair with all things Greek. Why I want to read this: As an avid reader, full-time copyeditor, and part-time book reviewer how could I say no to this? Norris is not only an impeccable editor but an entertaining and thoughtful writer. This is (as you might have guessed) on my must-read list for this month. Here Is Where I Walk: Episodes From a Life in the Forest by Leslie Carol Roberts (University of Nevada Press, April 3). In the essays collected here, Roberts muses about travel, nature, motherhood, and the environment, all linked by the time she has spent in America's only residential national park, the Presidio in San Francisco. Why I want to read this: I'm a big walker and love to spend as much time as possible in my local parks and state forests. I wonder if Roberts and I think about the same kinds of things when we're in the woods. The Field Guide to Dumb Birds of North America by Matt Kracht (Chronicle Books, April 2). Do you think you can you identify the common birds that hop around your yard and build nests in your hanging plants? Kracht bets you don't know their real names: how about the black-capped prickadee and goddamned Canada goose? Why I want to read this: I love watching the birds in my yard and tending to my bird feeders, but I also have a good sense of humor. This guide offers solid information about our feathered friends but it's served with an irreverent attitude. The illustrations (see the cover) are nicely done. 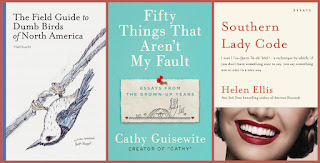 Fifty Things That Aren't My Fault by Cathy Guisewite (Putnam, April 2). In this collection, Guisewite steps away from her beloved comic strip (Cathy) to talk about life and family in the sandwich years and her complex perspectives on grown children, aging parents, and retirement. Why I want to read this: I've always been a huge Cathy fan and, hey, Guisewite and I are about the same age, so I can relate. I love her viewpoint. Southern Lady Code: Essays by Helen Ellis (Doubleday, April 16). In her newest collection of essays, Ellis talks about, as the publisher says, "marriage and manners, thank-you notes and three-ways, ghosts, gunshots, gynecology, and the . . . art of living as a Southern Lady." Why I want to read this: Even though I'm a Yankee through and through, I'm a fan of Ellis's outlook on life. In her new book, she offers a fresh angle on being a displaced southern belle in the modern world. I'm ready to laugh. The Five: The Untold Lives of the Women Killed by Jack the Ripper by Hallie Rubenhold (Houghton Mifflin Harcourt, April 9). Much has been written about Jack the Ripper, a murderer who has never been definitively identified. But who were the women he killed? What were their stories? Why I want to read this: I like true crime and want to know more about the victims whose names and lives have been overshadowed by the man who killed them. A snapshot of the dark side of the Victorian era by a historian. 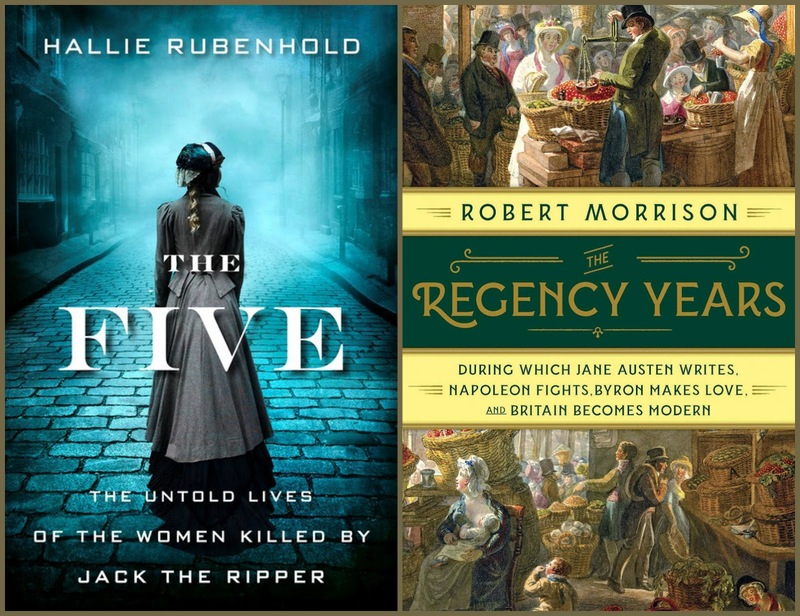 The Regency Years: During Which Jane Austen Writes, Napoleon Fights, Byron Makes Love, and Britain Becomes Modern by Robert Morrison (Norton, April 30). The Regency period provides an endless source of interest and is pretty much summed up by the book's subtitle. Ocean battles, global trade, the arts, new technology, and changing politics; it was a vibrant and not always pretty era. Why I want to read this: Some of my favorite authors published during this time and some of my favorite novels were set during this time. Plus I love history and always appreciate an accessible and easy-to-read account of the past. They all sound interesting and are all new to me except Fifty Things That Aren't My Fault which I have on my list at the library. Science Comics catches my eye - it's probably at my level. I'm listening to Southern Lady Code right now - it has humorous moments but it's not laugh out loud funny to me. 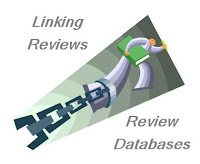 Thanks for highlighting this great list of books - I see several I want to check out. I also think the Regency years are fascinating. 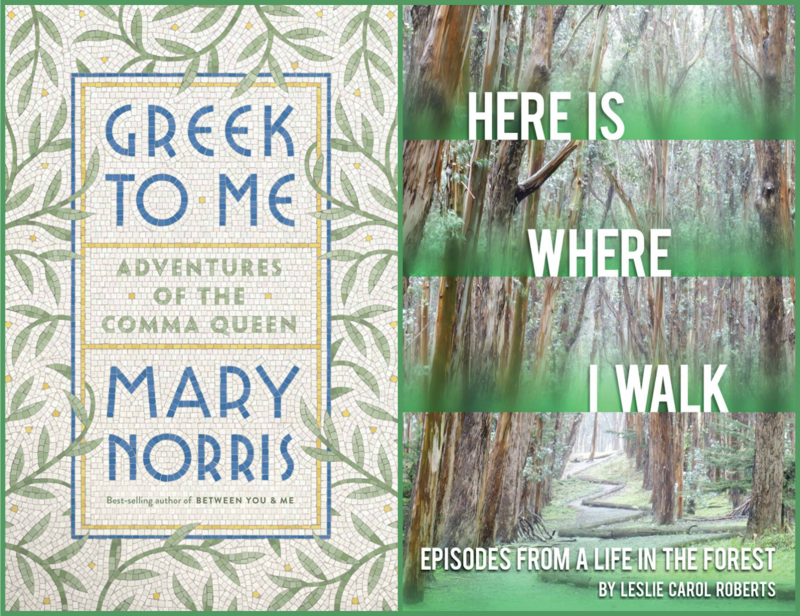 Mary Norris and Fifty Things are already on my list, but a few other look appealing, too.